“Happy Father’s Day” from all of us fathers.com. No, I haven’t changed the calendar or lost my mind. I know this isn’t the middle of June. At fathers.com, we’re about inspiring and equipping men to be the best dads they can be. And that means that just about every day should feel a little like Father’s Day. I’m not saying you should ask for gifts or special treatment every day. Instead, I’m asking you to consider the positive thoughts and motivations from a typical Father’s Day and find fresh inspiration every day. First, know that you’re appreciated for what you do as a dad every day, even if no one says it every day. Then use those positive feelings to maintain a high commitment to your children. There’s no need to overthink this. Simple truths become life-changing when we take them to heart—and when we make important things a priority. Fatherhood is no different. One simple, “deep” thought that can keep us going is the awesome privilege it is to be a dad. On Father’s Day, do you feel proud to be a dad to your unique and incredible kids? And then aren’t you more motivated to give them more of your time, energy and devotion? There’s no reason we can’t capture some of those same feelings and commitments at other times of the year. Like today, even. We should all soak up every minute we get to spend with a teenage son, a preschool daughter, driving them to lacrosse practice, tying a shoe, playing games. Are there challenges and hard times? Of course. But we can proactively turn the atmosphere positive with our families and be a force for good in their lives. Dads, be a little awestruck about the privilege and responsibility that comes with fatherhood. Then step up and do your best. Your kids need you, and you are uniquely called and equipped to be their dad. Make a simple but life-changing commitment to do your best for your children every day. It isn’t brain surgery, but then making a daily commitment isn’t so easy either. But you know being a good dad is one of the most important threads that runs through many different challenging issues in our country. If collectively we get fatherhood right—being involved, aware, loving role models for our children and other children who need us—together we can help solve a lot of social evils. 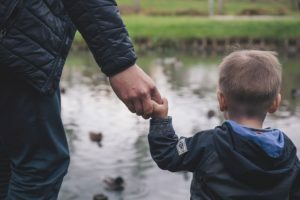 Many dads are struggling to overcome a painful past, and a lot of other guys are hampered by distance from their kids and/or hostility with the kids’ mother. Those are very real challenges. Still, hold in mind the privilege that it is to be Daddy to your children. In some cases, doing your best for them might take all the courage and strength you have. But if you don’t do it, who will? Dad, you can do it. And they are worth it!